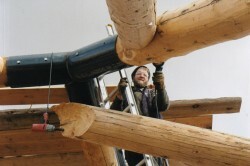 We are proud of the legacy we've built in every single log home and cabin constructed by Clearwater Log Structures. We've shared a few customer reviews received, and will be adding more in the future. After many years of researching and dreaming of building a log home, my husband and I finally decided to pursue it. So after meeting with a couple local log builders, we found JR [ Troyer ] through a local demo site in our area. JR graciously allowed us to interrupt his weekend by meeting with us and showing us his current project. It was obvious immediately he took great care to ensure the home was well crafted, and that each hand hewn log fit just right with the surrounding logs. He politely and patiently answered all our questions, and even recommended a designer and building crew whom could assist with finalizing the entire home construction. So all in all, it didn’t take us long to decide that JR was the right fit for us; a professional with experience we could trust to make the right decision without cutting corners. The project was completed on time, at a fraction of the price quoted by the other log builders, and with greater attention to detail and craftsmanship than I saw from the other outfits. With JR, his suggested designer and building crew, we now have a log home we’re proud to show off to others. Though not a large home, we’ve had strangers stop by to admire the large, hand hewn logs with it’s saddle notched corners and Alaskan style ends. It’s a home we can comfortably grow old in, and share with those we love for years to come. 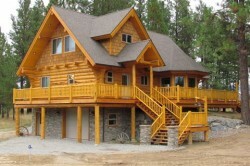 Should you be in the market for a log home, you’re welcome to come see ours in Blanchard, Idaho. We highly recommend going with Clearwater Log Structures, and JR’s suggested designer and building crew.